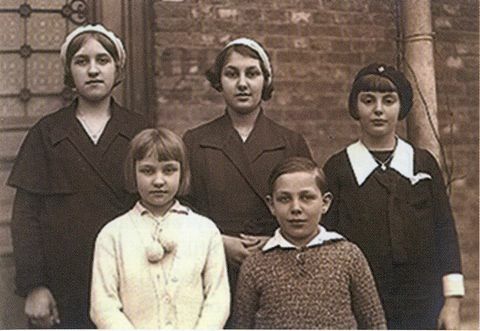 On the evening of November 29, 1932, Albert Voisin (11) and sister Fernande Voisin (15) met up with their best friends, Gilberte (9) and Andree (14) Degeimbre to walk to the convent academy to meet Albert’s sister, Gilberte Voisin (13), who was staying late to study until 6:30 p.m. They entered the grounds and passed a small Lourdes grotto in front of the railway embankment that skirted the convent garden. Albert saw her first and said that he saw the Virgin Mary, dressed in white, walking above the railroad bridge. The children scoffed and ignored him until they saw her too — just as he had described. The girls looked and could see the luminous figure of a lady dressed in white, walking in mid-air, her feet hidden by a little cloud. Now they were pounding on the convent door, but the irritated nun, Sister Valeria, could not see anything in the sky. When Albert’s sister came to the doorway, she immediately saw the glowing lady also. They raced to their homes fearfully, but no adults would believe their incredible story, and they were sent to bed in disgrace for such lies. Sister Valeria reported the incident to Mother Superior Theophile, who scolded her for such nonsense. The next night it happened again, but this time they were delighted to see her — yet still nobody believed them. Adults began to suspect tricksters perpetrating a hoax, so at least six adults trailed the children on the third night in a protective and investigative manner. The five children shrieked with delight when they saw her —even closer this time where they could see her beautiful features in greater detail. Her feet were hidden by a little cloud as she floated only a couple feet above the ground in front of them. She was dressed in a glowing white gown, hands joined in prayer, blue eyes raised toward Heaven with rays of light surrounding her head. But she reached outward with her arms and then disappeared. The children ran to find the adults who had spread out to watch for pranksters. The five visionary children in Beauraing, Belgium, 1933. Suddenly, the children were overwhelmed as Mary re-appeared near the shrubs of the convent entry gate. But the adults could not see what all the children had reacted to. One mother decided to return later that night with three of the older kids to investigate further. The three dropped hard to their knees, simultaneously, on the cobble-stoned street, reciting the Hail Mary “as one voice” of a high pitch. The mother was impressed that they seemed to be looking at the same exact yet invisible object. As she approached where they were gazing, her own daughter cautioned her not to walk into Mary as it might offend or disrespect Mary. The mother began to believe. Mother Theophile addressed all the children severely in school and said that there would be “no talk of visions.” On the next evening, Mother Theophile padlocked the convent’s garden gate and let dogs loose in the yard as a further disincentive to the curious. But this did not deter the children or the curious adults. On December 2, during the next vision, Albert asked if she was the Immaculate Virgin. She nodded yes to the two girls. When asked what she wanted from them, she replied, “Always be good.” The adults heard the girls answer in unison as if one voice, “Yes, we will always be good.” More visits continued with more people gathering to watch as word continued to spread quickly. The Virgin Mary appears to the children much to their amazement. On Sunday, December 4, the children assembled at about 6:30 p.m. – this time bringing with them a little boy with polio and the blind uncle of the Degeimbre girls. Again, they asked Mary if she was indeed the Blessed Virgin, to which she nodded yes. They asked her to heal the two sick people, but there was no obvious response. 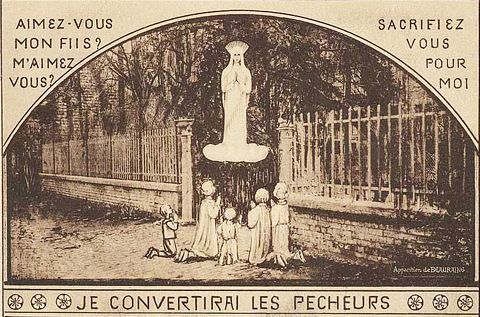 On December 5, the children were being watched by a very large crowd when Albert asked the Virgin for some sign to convince the adults that the visions were authentic. On the 6th, Blessed Mary appeared with a Rosary, so the children immediately began to pray it. She asked them to be present on the 8th. By December 8, on the Feast of the Immaculate Conception, up to 15,000 were in attendance near the convent. During this beautiful visitation only visible to the children, Dr. Maistriaux studied the children carefully — lighting a match under Gilberte’s hand, getting no response or burns. Pinching, pin pricks, and shining bright lights never affected their eyes nor broke their concentration. The local priest, Father Lambert, and the church authorities were taking a very cautious and prudent attitude, refusing to get involved. The local bishop ordered his priests not to go to the site. The apparitions did not occur every night, but the children assembled and prayed the Rosary anyway. When she did appear, they would all drop to their knees in unison. 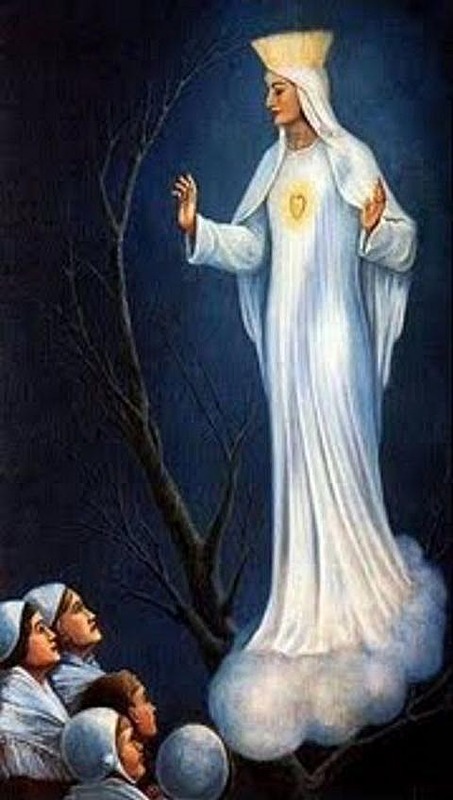 When questioned afterwards, separately, they stated that Mary told them that her last apparition would take place soon. 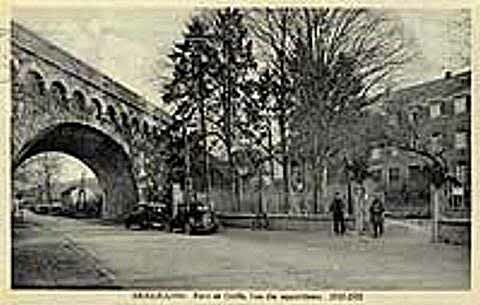 The railroad bridge and convent where the apparitions occurred. Nine thousand people showed up on December 29, hoping for some miracle. 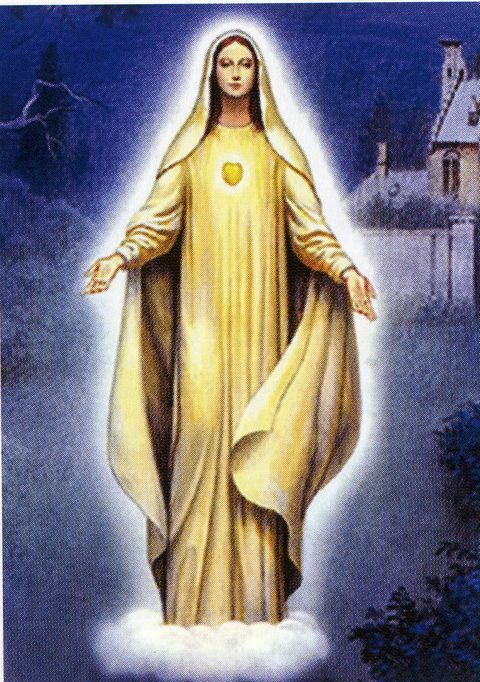 On that evening, Fernande Voisin claimed to have seen the Virgin reveal a golden heart, radiating heavenly rays of light. 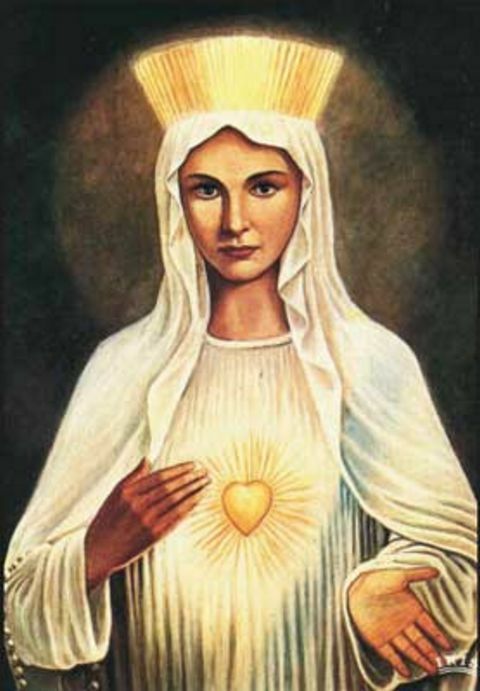 On December 30, Gilberte Voisin and Andree Degeimbre also witnessed the golden heart of Mary – along with Fernande, who heard Our Lady state, “Pray, pray very much.” On the last day of 1932, all the children saw Mary’s golden heart. On January 2, Mary indicated that January 3 would be her last visit, but that she would speak to each of them separately. The children kneel all at once before Mary near the convent gate. Within a few weeks of the last visit, reports of miracle healings began. A young girl, Pauline Dereppe, was healed of a severe bone disease after praying at Beauraing. A middle-aged woman, Madame Van Laer, was cured of her tuberculosis. As this news spread, two and a half million pilgrims traveled to Beauraing in 1933! In May of 1933, the Bishop of Namur set up a committee to evaluate the visions. In 1943 Bishop Charue authorized public devotions to Mary at Beauraing. Finally, in July of 1949, the apparitions were finally approved by the investigating committee (after 16 years). Many more appearances of the Virgin occur over the next months. Albert Voisin became a missionary schoolmaster in the Belgian Congo. Others married and raised children. Pope John Paul II visited the official shrine on May 18, 1985. The Beauraing cemetery now contains the tombs of Andree Degeimbre and Fernande Voisin.